Dominion Day always reminds me of how important Barkerville has been, and continues to be, in the story of my life. Twenty-two years ago – on July 1st, 1993 – I participated in my first Dominion Day celebration in Barkerville as Miss Florence Wilson. It was all very new and exciting for me, and as the old-fashioned games day commenced I had absolutely no idea what I was supposed to be doing. Thankfully, veteran interpreters guided me and the other rookies through an impressive array of historically appropriate games and activities like the hammer toss, ladies egg and spoon race, broad jump, funny face contest, etc., etc. When time came for the egg toss challenge, a sweet and very polite young man approached me and asked if I would be his partner. The egg toss requires a line-up of adults and a line-up of children to throw eggs to each other, back and forth, over gradually increasing distances. Once an egg breaks, the adult/child pair that was throwing it is disqualified. The boy who’d asked to team up with me was not quite a stranger. I’d seen him before. He was a Barkerville kid, and that summer he was working as the town paperboy, selling copies of the Cariboo Sentinel from a canvas satchel he carried around all day. He introduced himself as Brad. Brad and I joined the long line of egg-tossers. The row of participants was impressive: it stretched right across the main street of town, from one side of a grassy clearing to the opposite boardwalk. As we began, I tossed the egg a couple of feet through the air to Brad, and he caught it. We each then took a step backwards, and he threw the egg back to me. The whole line of players kept doing this, over and over, taking another step backwards each time. The game grew more and more difficult as the distance between us increased. The teams around us were dropping like flies. Eggs smashed into the ground or exploded in people’s hands and on their faces, and the number of participants decreased with each turn. Now, I freely admit that Brad and I were not very good at the egg toss. In fact, we were just awful at the game… but, for some reason (I suspect divine intervention) our egg just wouldn’t break. Even when one of us missed a catch, that egg would somehow just hit the grass and roll. It was amazing, really. We started to get really excited as it dawned on us that we might actually win this thing. In the midst of some surprisingly cutthroat competition, Miss Wilson and the paperboy – neither of whom could throw or catch very well – were among the last teams standing. A few field-wide pitches later… we won. Brad and I won the Barkerville Egg Toss of 1993! I got to know Brad quite well that summer. We called him “Little Brad” in order to differentiate him from a grown-up interpreter who was also called Brad. Little Brad’s family later moved from the area, and I didn’t see him again for years. Then, one night in the Wells Hotel pub about ten years later, a young man approached my table and asked if I remembered him. It was Little Brad. He was all grown up now, and was back in Wells and Barkerville for a visit. Little Brad and I have kept in touch via social media over the years since. I now live in Wells full-time, and for a long time he was living in Alberta. About a year ago Brad sent me a message to let me know that he and his wife and two young children were moving to Quesnel, having recently acquired a local business. And just yesterday I was helping with another Barkerville Dominion Day event – this one the children’s broad jump. I was excited to be there, as my six year old twin daughters were participating for the first time. As the name of each participant was called out, I thought I recognized the name of Little Brad’s daughter. I quickly scanned the crowd and there he was: Little Brad. Not so little anymore. We smiled to each other and laughed across the sawdust pit as it dawned on us both that twenty-two years after becoming friends over our miraculous egg toss victory, our own children were now part of the same Barkerville Dominion Day tradition. “Did you ever think you’d see the day?” I called over to Little Brad. “No, never!” he called back. One of my favourite things about being a long-time resident of Barkerville is seeing the circles and connections that come from being part of something that matters so much to so many. In the everyday minutiae of coming to work, doing our jobs, and heading home, it can be easy momentarily forget that we are part of a very big story. My story starts in 1862 when Billy Barker hit pay dirt 52 feet below Williams Creek, travels along the curves and edges of subsequent gold rushes, including the hard rock boom of Wells in the 1930s, embraces the plot twist of Barkerville becoming a museum in 1958, and rolls right along to the present day. It’s such a good story, and so many of you are in it. 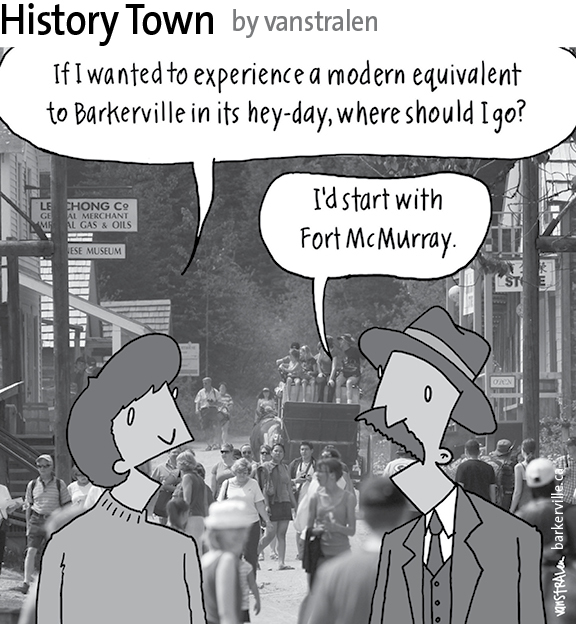 The above one-panel cartoon (originally published July 4th, 2015) by Dirk Van Stralen, with accompanying editorial by Danette Boucher, is the fifth of twenty weekly entries that were logged – and subsequently blogged – as part of a 2015 collaboration between Barkerville, British Columbia and the Prince George Citizen aimed at introducing some of the quirkier advantages to living, working, and playing in the Cariboo Goldfields. We hope you enjoy!